Earlier on last week, we jumped out of our seats when 2PetalRose posted a photo of his classic Shikomi which was originally released back in 2015. We thought a re-run of some kind. Low and behold an AUCTION was announced! “I’ve decided to put my own personal Shikomi up for auction. This was a release of 15 pieces worldwide back in 2015!! and this was number 16!” –2PetalRose Cast your minds back to 2015 as you’ll have the chance to own this artist proof. 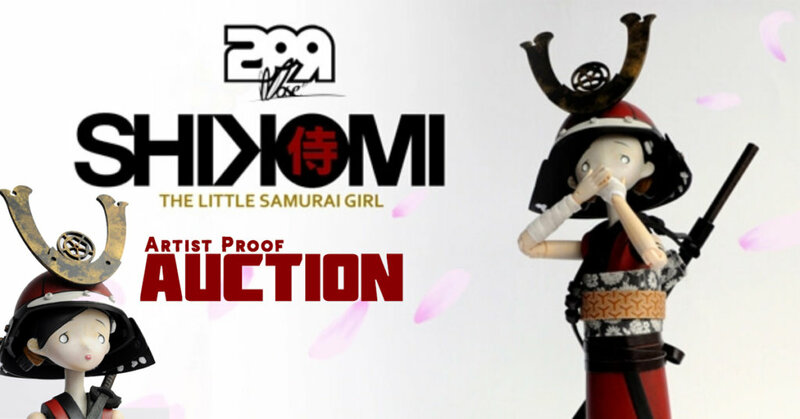 Shikomi has all the trademark designs from 2Petalrose but Shikomi is a posable figure but with elegant and new era Japanese style. Do we have a game changer on our hands? I think we do, as we haven’t seen anything like Shikomi in this scene. Plus she is bloody beautiful. Enough of us rambling, 2Petalrose presents you Shikomi! Shikomi garments are beautiful but we didn’t expect anything less from 2Petalrose, right? having the removable helmet is another plus point as it gives Shikomi a new look instantly. Without the helmet it uncovers 2Petalrose sculpting work with her hair. With constant trial and errors and endless hours refining her, everything was taken into consideration. From felt lined helmet to stop it from rubbing against the paintwork and head ball jointed arms and legs which means articulation is smooth. The base and feet are filled with magnets for stability. 2Petalrose uses joints from a pre-made doll due to the fact his own resin versions didn’t last long. Measuring a little over 12 inches in height. Custom designed and printed fabric. Made from Resin and BJD parts.